Arctic Academy is a programme service company offering you important knowledge about Northern Lights, so that you know what to look for and when, after you return back to your hotel during your Lapland visit. 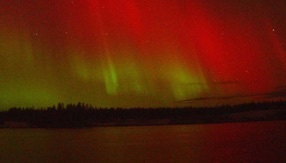 Northern Lights shows are arranged for groups by advance booking at the company's fixed base, the Aurora House. 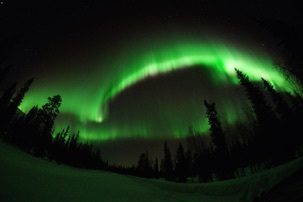 A skilled local Northern Lights guide will introduce to you Nature's most beautiful color display - the active Northern Lights, Aurora Borealis - in a 45 minutes lasting video and picture show. Also information of current space weather situation and probability of seeing the real aurora during coming days is given. The person behind the program is an active researcher of the Northern Lights at the Sodankylä Geophysical Observatory, Dr. Esa Turunen. He has studied Aurora more than 30 years at Sodankylä and spent thousands of nights outside while shooting the images and video footage. The Northern Lights guide Riikka Maijanen has lived in Lapland since childhood, being literally raised up under the lights, and is an enthusiastic expert in all beautiful appearances of Lappish Nature, including local plants and animals. Aurora House is located 38 km by car from Luosto, only 25 km by snowmobile and 11 km by car from Sodankylä, on eastern side of river Kitinen.